Forex investing: how to invest in PAMM? InstaForex PAMM forex system gives an opportunity to invest in Forex projects. Every customer of InstaForex Company can accept forex investments from other traders or invest funds in PAMM forex accounts and become a shareholder of this account. Investors use the system of PAMM forex accounts in order to invest in forex their funds in trader accounts with the purpose of taking a part of profit made by traders. The process of forex investing implies the transfer of funds under the company's control which entitles an investor to a share in a trader account proportionate to the forex investment. What opportunities does the PAMM forex system give? The PAMM forex system by InstaForex provides all its users with control and report on all operations, shares and returns in an automatic mode. A trader can accept an unlimited number of forex investments of unlimited amount from an unlimited number of investors. A trader account can be invested with ANY amount, i.e. from 1 up to hundreds of thousands US dollars from every investor, depending on what share of the account each investor wants to hold. In the PAMM forex FAQ section you can always find the answers to your questions regarding all aspects of the PAMM forex system by InstaForex Company. Thanks to the customer feedback, this section is constantly updated. In order to register with the PAMM forex system, you must first open a live trading account with InstaForex Company. 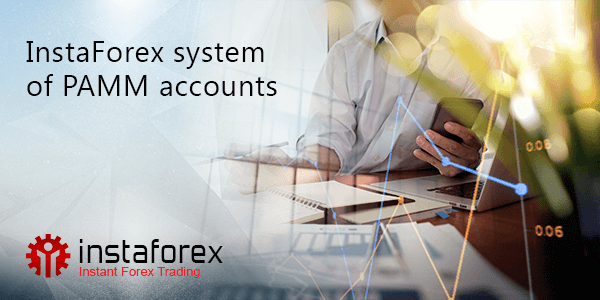 If you already have a live account with InstaForex, you can start registering with the PAMM forex system right now. The process of registration with InstaForex PAMM forex system is described in the corresponding section step by step. With the help of PAMM forex Monitoring, you can choose PAMM forex accounts that you find the most attractive for investing in forex. Besides, you will always be able to see the success dynamics of your managing trader over a certain period. InstaForex PAMM forex system is an infallible method to invest funds in Forex traders without any limitations on minimum or maximum amount of forex investment: all investments, from 1 to hundreds of thousands US dollars, are processed online. InstaForex PAMM forex system is the best way to attract forex investments to your trading account. If you want to attract forex investments to your trading account, the PAMM forex system by InstaForex will make your quest for investors quick and convenient. The PAMM forex system by InstaForex Company is an interesting and efficient instrument for partners of the company. This tool allows attracting more customers and boosting partner profit. Nowadays the universal system of PAMM forex accounts by InstaForex is an exclusive offer on the Forex service market.